Multi Use Games areas provide terrific playing surfaces for a variety of games and sports including football, tennis, basketball, hockey, netball and roller-skating At En-Tout-Cas, we have designed and built hundreds of Multi-Use Games Areas (or MUGAs for short). We specialise in complete design and build projects, from excavating the site and landscaping to manufacturing a fence support that doubles as a basketball post. We have the skills and knowledge to act as main contractors, guiding clients through safety regulations and liaising with planning authorities. Our in-house lighting consultancy provides informed comment and advice on lighting systems, a thorny planning issue. At En-Tout-Cas, we're happy to explain the benefits and suitability of each surface, to give you the best possible sports surface for your needs. 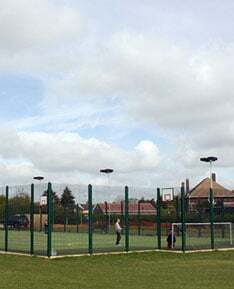 Grants towards installing a MUGA are available from district councils, parish councils, county councils, the English Sports Council, lotteries, waste tax companies, private donation and the Football Association! Your choice of sport will determine which surface is best for you and we are always happy to discuss the project and give you’re the benefit of our advice. 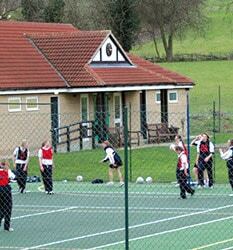 En-Tout-Cas offer a range of six superb MUGA surfaces to suit every requirement. 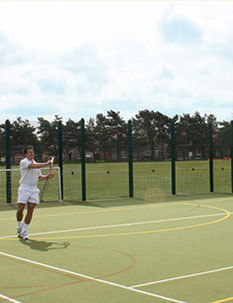 An acrylic-coated porous macadam gives good service for tennis, netball, soccer and basketball. Pladek is not well suited to either hockey or roller-skating. Savanna is a polyethylene half-sand-filled carpet. It is ideal for tennis, soccer, netball hockey, or bowls. Not recommended for roller-skating. This is the ideal surface for a multi-use games surface - where multiple sports really are the order of the day. This porous needle-punched polypropylene carpet with minimal sand filling is one of the few surfaces accepted for netball as well as for tennis, netball and soccer. The surface is not suitable for roller-skates. An impervious dense macadam ideal for roller skating, tennis, soccer, hockey and netball. It is worth noting that its impervious nature, which is necessary to achieve the strength required, does mean it will develop puddles in wet weather. A long texturised mono-filament polyethylene fibre that is partly filled with rubber and sand. ETC 3G is designed to meet the FIFA one-star rating for football and FIH for hockey. This surface is made of sand-dressed dense Polyethylene texturised mono-filament fibres with narrow blades. Evolution is designed to meet the FIH Standard category and is therefore suitable for hockey, up to and including international standard.